In this time of fast food chains and busy lives, sandwiches can be a life saver. Food that can be taken away from the kitchen to be eaten whenever and wherever hunger strikes. Food that is ready assembled and requires no utensils to eat it. But they are by no means a new invention. In the Middle Ages, when knives and spoons were the only cutlery and plates were a luxury item, food was often presented on thick slices of stale bread called trenchers. The bread would soak up any sauce, but could also be torn into chunks and used to lift food to the mouth. The well-to-do would only eat the food that was placed on the trencher, leaving the bread to be given to the needy at the end of the meal, but most people enjoyed the trencher along with their meal. This very useful method saves the labours of washing dishes and if you plan a party for a lot of friends you should try it out - it's fun! That something, according to the popular legend, turned out to be cold beef between two slices of bread, and had the added advantage that the earl did not even have to put his cards down to eat it. The idea caught on, and anyone who's ever eaten lunch while reading e-mail or finishing a last minute report, knows exactly why the earl was so enchanted. 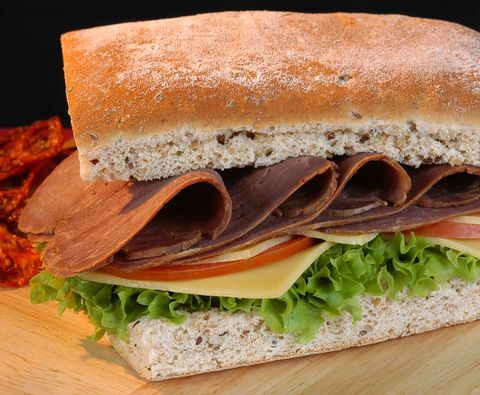 For many people in England, sandwiches are the regular lunchtime food, either eaten at work - when they often become truly fast food - or when out exploring the countryside. When consumed on the premises of an English pub, this lunchtime treat can assume enormous proportions, and be served with salads, chips and all sorts of interesting garnishes. Probably the most famous of all pub lunches involving bread, a Ploughman's Lunch, can be a wonderful thing to behold. Crusty bread, a large wedge of cheese, pickled onions, sandwich pickle or chutney, an apple, some soft lettuce - here is lunch with a capital L.
For "cheese" read Cheddar or Stilton or Lancashire ... or any other hard cheese that takes your fancy. 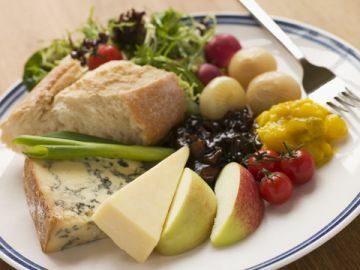 Everybody in England has their own opinion on which cheese is best in a Ploughman's, so you cannot go far wrong. Most people think of cheese or cold meat when considering their lunch, but there are certain rules to be observed to turn bread and a filling into a memorable meal. First, use decent bread! Pre-sliced plastic is only useful when making bacon "sarnies" in the middle of the night on the return from the pub. Second, be generous with the filling. And third, be imaginative with your condiments. Chutneys, pickles, ketchups and mustards of all kinds have been used and lovingly made in England for generations and can be uncommonly good. They brighten up the same old "bread and" lunch no end. The quintessential English sandwich would most probably be roast beef with creamed horseradish and watercress, but I don't think I'll stick my neck out on that one just yet. And if you fancy something slightly more unusual, you could try Lancashire cheese in a Hot Cross Bun or a crab sandwich, right by the seaside. There are plenty more ideas for tasty bread and filling on the picnic sandwiches page. Not enough with being generous and filling, sandwiches can also become truly classy, especially when served as part of a traditional afternoon tea. For this remove the crusts from the bread and adjust the filling so the bread can be cut into bite-size pieces. or cold tongue set in aspic jelly. You could even try your hand at strawberry sandwiches and truly WOW your friends. You need a soft white bread for this, but once you have this, it's easy. Just butter your bread, cover with thin slices of strawberries and add a minute sprinkling of black pepper. Cover with a second slice of buttered bread, press down slightly and cut. The sky's the limit to your imagination when thinking up delicious fillings for your bread and if you need more ideas you can find them on the tea sandwich recipes page. Just remember that your offerings should be delicate enough to complement the tea and that they won't spoil your appetite for the scones and pastries yet to come. Look through the recipe section for ideas!